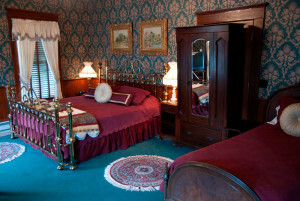 This room features a King size brass bed and a twin size bed with four windows overlooking Historic Main Street and the wooded hillside of the Wildcat Mountain. Fully decorated in green, burgundy and gold tones along with dark woodwork and 9’ ceilings. This room offers a very calm atmosphere while relaxing in the sitting area on the velvet covered rocking chair. This room offers a private bath and shower. Note: The balcony is currently closed due to renovation.